Your home’s envelope takes a beating every winter and into early spring. 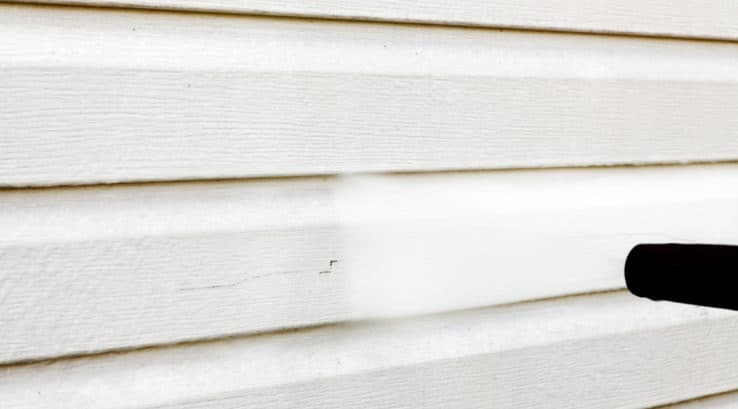 Snow, wind, and cold spring rains can all contribute to your siding looking dingy, dirty, and even moldy if a particular area doesn’t get enough sunlight. Spring is a great time to give your siding a good scrub down. While vinyl siding is a maintenance free option for your home, it can still benefit from periodic cleaning to keep it looking like new. Before you begin cleaning your siding, take some steps to protect the surrounding landscaping and electrical items. Cover outlets and outdoor light fixtures with plastic and tape, as well as laying plastic or a light tarp over shrubbery and landscape plants that your cleaning solution could harm. Select your cleaning solution carefully. Not only can chlorine bleach and harsh chemicals damage your landscaping, but you also need to keep in mind the runoff that will cause these chemicals to end up in our waterways. Dish soap or laundry soap mixed with warm water are efficient at cleaning your siding. Oxygenated non-chlorine bleach like Oxy-Clean or a natural cleaning solution like Simple Green are both environmentally kind choices. And plain old white vinegar is great for stubborn mold spots. When cleaning your siding, you want to work in steps. First, hose down one section of siding using a garden hose. Be sure to direct the hose spray from the top down. Otherwise, you risk water getting behind the siding and causing a host of problems including mold growth and damage to your home’s framing. You can use a handheld spray bottle to apply your dish soap mixture. Using a wet soft-bristled brush, start from the bottom of your section and scrub from side to side. Obviously, you may have to use a ladder to reach the top if you have a two story home or a steep roof pitch. Keep ladder safety in mind. Once you reach the top of that section, rinse with your garden hose from the top down. Make sure you work in small enough sections that the soap doesn’t dry before you have a chance to rinse it. If you are located on a wooded lot or have areas of your siding that get little or no sun, you may have green or black mold and mildew spots. Regular dish soap or laundry soap usually won’t get rid of these spots. This is when you want to break out the Oxy-Clean or Simple Green. Use a 1:10 ratio of cleaning solution to water, apply in the same manner as your other areas, and allow to sit for a few minutes. Then scrub clean with a soft bristled brush and rinse well. Again, it bears repeating that you should take all safety precautions when working on a ladder. Ladder falls injure over 500,000 people each year in the U.S., require 164,000 emergency room visits, and cause 300 deaths. Make sure you’re using the proper safety procedures, including proper setup and maneuvering the ladder. If you are at all hesitant, consider hiring a professional to clean your siding.